Christmas is one of those holidays that just seems to be filled with cheer and wonder. Whether you are celebrating a secular or religious Christmas, it is a day for fun, love, and happiness With a little help from wikihow, you will learn how to celebrate a secular, religious, kid-friendly, or consumer-free Christmas after the jump. Happy Holidays! Spread cheer. When you hear Christmas songs, instead of acting grumpy, smile and whistle along. Being cheerful during the Christmas season really will help in spreading Christmas spirit to those around you, plus it helps you enjoy it more too. Wish others a Merry Christmas if you know they celebrate Christmas. If you’re not sure, just say “Happy Holidays”! Either way, you are spreading the holiday cheer. Enjoy your country’s Christmas traditions. Let yourself be a kid again and enjoy the holiday spirit. Whether it’s leaving cookies out for Santa Claus, watching for Papa Noel out the window or leaving your clogs by the fire for Santa, indulge in a little holiday tradition and give into the magic. Do some research about Christmas customs around the world. There are some great books that describe these traditions and give additional recipes and craft projects. The web is also a great resource for seeking out new and exciting traditions and new recipes. Go to a local cultural center to learn about different Christmas customs. 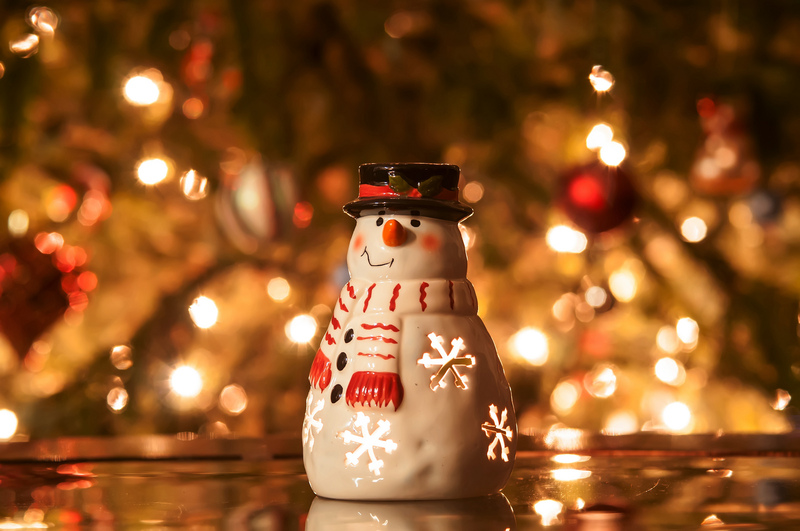 Many museums and libraries hold special holiday events and exhibits for the family to attend. Some Christmas tree festivals feature the usual tree decked out in ethnic ornaments and decor. Do a little holiday time travel! You can also research holiday customs of American past. Christmas customs of years gone by are pretty much different than those of today. Popcorn and/or cranberry garland threading is a custom that is old as Victorian times. Before the glass balls in American holiday displays, came the ornaments made of paper and corn husks. Many moms fashioned granny dolls or yarn dolls for their daughters. Pick up any of these customs to put a twist on your modern celebrations. Some customs however are not practical or safe. Never put candles on a tree! You can use safer electric candles instead. Using real fruit or other edible items can be expensive and viewed by others as a waste of food. Select artificial or inedible ones instead. Decorate your house for Christmas. The possibilities for decorating are nearly endless. Put Christmas lights on your house. Hang mistletoe in the doorways (particularly if you know that special someone is coming over,) hang a homemade wreath on your door, or put Christmas figurines like Santa or Rudolph out on your counters. Buy and decorate a Christmas tree. Go with your family to your local Christmas tree farm to cut your own or head to a lot selling pre-cut Christmas trees. Pick out a Christmas tree that fits your house. After you’ve gotten your tree situated, wrap it in lights and begin hanging the ornaments. Don’t forget to water it occasionally and safeguard it from pets! You can decorate your tree with family heirloom ornaments or try something new by decorating a tree with Star Trek or superhero themed ornaments, or with little trains, or with Disney characters for example. It’s really up to you–be as creative or traditional as you like. Join up with friends and family. For many people, Christmas is about gathering with friends and family to enjoy each other’s company and celebrate the holiday. The day is a national holiday and most folks get a day off work. Take advantage of this time to reconnect with friends and family. Create your own traditions or celebrate with the traditions that have been passed down in your family. Invite your friends or family over for Christmas dinner. Make it a potluck if you want to keep expenses (and the workload) manageable. The important thing is just to get together with people you love and make the winter a little warmer by sharing the warmth of caring with them. Consider making a traditional Christmas dinner complete with roast turkey, or create your own traditions by branching out and making whatever you want! Go Christmas caroling. Either have it at your home, go door to door, or go to an old folks’ home and do it. Learn some Christmas or seasonal songs, and sing! It’s fun, and even if your voice isn’t great, hopefully, you won’t be singing alone––you’ll get some cover from your more talented friends! If you can’t go caroling for some reason, blast Christmas music throughout your house, while you’re wrapping presents, or during your Christmas party.